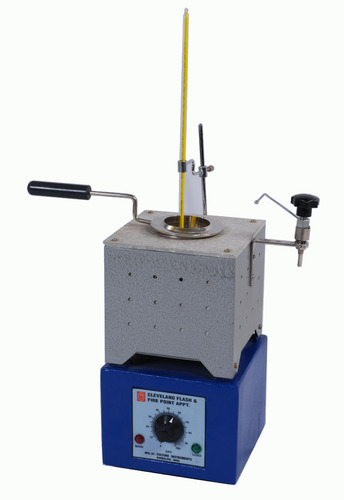 This apparatus is used for determination of Flash Point & Fire Point of Petroleum products except fuel oil with open flash 800C as per specification IP 36/57, IS 1448 (P:69) 1969 and ASTM-D-92-67. The apparatus consists of a cup, heating plate, thermometer clip and test flame attachment with swivel joint for passing over liquid surface in the prescribed manner, heater is controlled by means of Energy Regulator for operation on 230 volts, 50Hz, AC single phase. 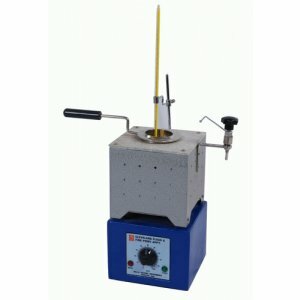 Cleaveland Flash Point Apparatus electric heated with voltage carriac copper coil type.